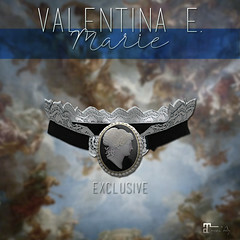 April 2018 – Valentina E.
NEW! Valentina E. Penelope Ensemble @ Pocket Gacha! NEW! Valentina E. Valeria Gown @ Bloom! NEW! Valentina E. Selena Dress @ The Chapter Four! NEW! 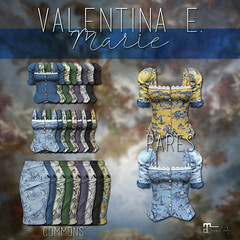 Valentina E. Sophie Separates @ FaMESHed! Out now at our main location and formerly at The Chapter Four our new Valentina E. Stella Suit! This gorgeous ensemble features a high waist, lace top, and optional tailored jacket. Find it in four color options, exclusively for Maitreya Lara.